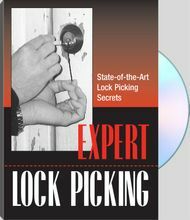 State-of-the-Art Lock Picking Secrets. One of the best lock pickers in the business demonstrate the fastest ways to open locks. Special see-through locks show how picks, rakes, snap guns and electronic picks exploit the weaknesses of everything from simple wafers to complex pin tumblers. This video is a must for professional locksmiths. For information purposes only.